B2M (Bathurst to Melville) were “Celebrating this moment” as they concluded their first-ever national tour – and, sadly, their last ever performance – with a sellout gig to (arguably) their most enthusiastic, most enduring fans in Darwin on 18 November. Having been hailed “Indigenous Australia’s answer to the Backstreet Boys” (by Huffington Post in 2016) B2M showcased their unique and catchy ballads and “RnB pop” as they delivered the messages they’ve been delivering since they formed in 2004 – messages of hope, strength and positive change. The seven-member “boy band” from the Tiwi Islands shared their Tiwi language, chants, dreamtime stories, dances, jokes, and anecdotes from their successful international tours against a backdrop of striking imagery from the Tiwi Islands. Their messages – in song and in spoken word – promote the unity of human kind, and the ability of music to cross cultural and linguistic barriers. Their international tour experience includes countries as diverse as Timor Leste, Taiwan, and Ireland, and their experiences internationally reinforce their messages. B2M’s retirement gig concluded with fans crowding onto the small dance floor, heartfelt thank yous, and with band member Shelton Murray’s widely-appreciated performance of Michael Jackson’s “Billy Jean”. 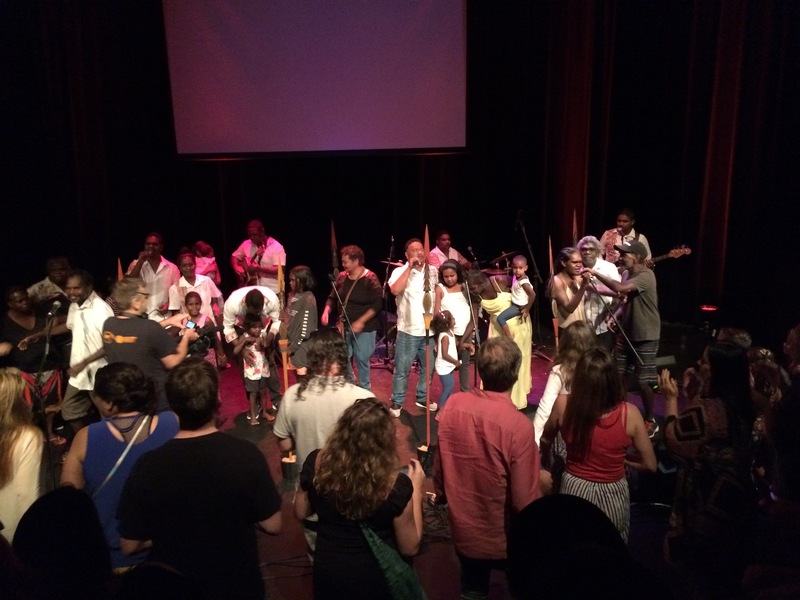 Family members joined B2M on stage for hugs, more dancing, and the final performance of Palingarri (Dreamtime). There were tears (on stage and in the audience) as we stood in appreciation of the amazing work and talent of the seven “boys” (men) from the Tiwi Islands who had taken the language, culture and stories of Tiwi Islands to mainland Australia, and around the globe. Australians’ knowledge of the Tiwi Islands as the home of amazing AFL players is heightened. B2M formed when the Tiwi Islands had Australia’s highest suicide rate and they used music and song to promote messages of empowerment, pride and hope. Their retirement will see them return to the Tiwi Islands and focus on their family and community. Their music and messages will stay with us.